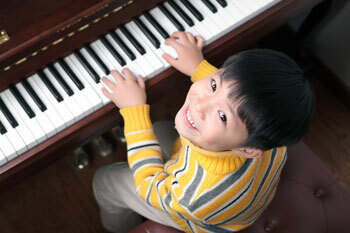 What is the best age for a child to start taking music lessons? …and which instrument is the best to begin with? According to a recent PBS article, the first five years of life are crucial for brain and motor development and within the first nine years of life, children have a unique “window of opportunity” that makes musical lessons particularly valuable. Music teachers face countless questions about how young a child can or should start music lessons. But, to be honest, the real concern is not the age of the child. Every single child is unique, and there is no formula for when or how a child should start lessons. Instead, the individual student should be considered. Here are a number of thoughts and considerations to help you assess whether your child is ready for violin, piano or other music lessons, regardless of age. The first step is to honestly assess your child’s abilities. Not only does a child need to understand basic counting and the alphabet in order to read music, they also need to be mature enough to sit and focus for the appropriate amount of time it takes to participate in a lesson. Experienced, professional teachers are usually able to work through normal attention-span issues and use fun activities to help keep a student interested while learning. We often find for children who have a particularly hard time focusing or staying on task, music lessons can be a great motivation and useful for the child to learn good listening skills. In fact, the discipline of listening, watching, learning and doing, is often very exciting for children, as they feel immediate gratification from little accomplishments…over and over. What if the Child is not ready yet? There are several things a parent can start doing from early childhood that can help prepare the child for music lessons. Playing music in the home, while they play or drive in the car… and talking about the instruments you hear on a recording. …It’s a fun way to increase a child’s awareness of the music in your lives. We encourage parents to take their child to see live musical performances too. …A concert violinist or pianist. …a string quartet or orchestra performance… or live music performances at community functions and your house of worship. Simple musical activities like dancing and drumming to music can help very young children learn to appreciate music while finding their sense of rhythm and tune. Also try simple one-on-one activities that require focus, following directions and patience. These activities do not even have to be music-related. Baking, gardening, and painting are great activities to try. Which Instrument is Best for a Child to Begin With? Think about what other musical experiences your child has had and talk to them about where their interests lie. …think about what instrument your child is drawn to. If your child is very young, they most likely will not form a very solid opinion. 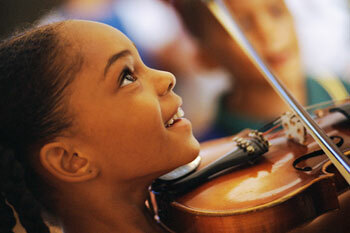 We suggest exposing your child to different instruments and trying to see what they are most drawn to. 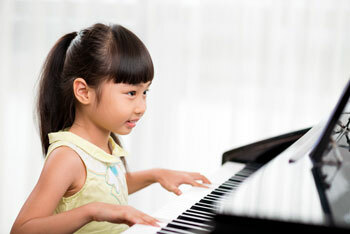 Typically, children can begin violin or piano lessons as young as 5 years old. A child’s physical size and strength normally preclude them from beginning guitar or drum lessons until they are about 7 or 8 years old. Woodwind instruments like the flute, clarinet and saxophone or brass instruments like the trumpet or trombone are not typically taught to children under the age of 9 or 10. It is worth noting that some parents prefer that their child learn piano first, because piano lays a very solid foundation for future music studies. This can be a great way for a child to learn overarching musical concepts before starting a more difficult instrument. However, as noted before, some parents realize that their child is more drawn to the violin and would be more motivated starting violin lessons. Moreover, some children can take on two instruments (piano and violin, for example), while others would become overwhelmed. Parents should also recognize, the younger the child is, the more effort will be required to help the child with their lessons, whether it be moral support, encouragement or assistance with practice. 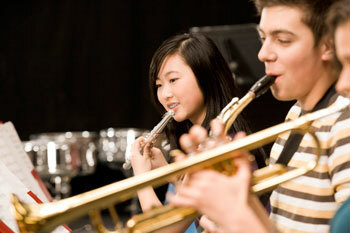 While age is a factor in deciding when a child should start music lessons, it is not the most important factor. These fundamentals should go a long way in helping you determine if your child is ready to start lessons and which instrument will be the best choice. Make sure to contact us if you have any more questions!